After a successful Hajj operation, a tour operator should start planning for next year’s Hajj and searching for new destinations in his tourism programmes. No serious company will rely solely on Hajj and Umrah operations. It was with this spirit I visited Al-‘Ula and Mada’in Saleh in Saudi Arabia. In the first part of this year, we had Saudi tour on our Summer Umrah package. It will not make any sense visiting the same places within Saudia for 2014 operation. There was need to explore new tourist sites for the purposes of innovation, making the tour more attractive to potential clients for next trip, and less boring for those who took part in the 2013 edition. I was to catch a flight to Riyadh, the capital, and connect a twice-a-week Saudi Arabian flight to Al-‘Ula, but the schedule would disrupt my plans of signing final papers of exit for our pilgrims. Therefore, I flew to Madeenah with Saudi Airlines where my tour guide, Mr Abdul Kareem Al Johani was waiting for me so we can drive to Al-‘Ula, the gateway to Mada’in Saleh, in his car. Abdul Kareem is a professional tour guide and a travel agent par excellence. As we left the Prince Muhammad bin Abdulaziz Airport, Madeenah we turned right to a road with a ‘Non-Muslims’ sign. Non-Muslims who come to Madeenah cannot follow the other road on the left, which leads to the Haram. I have never travelled on this road, the one on the right turn, for I had nothing to do in that part of Madeenah. This is good news, however, because it shows that non-Muslims could still go to Madeenah and travel to such tourist destinations like Al-‘Ula. No wonder, I met quite a number of non-Muslim Europeans and Americans at Madaa’in Saaleh and Al-‘Ula. On our way, my tour guide gave me lectures on the great people of his tribe, Johainah. He said any Madeenite whose name ends with Al Johani means that their ancestors were from the tribe of Johainah. He showed me the place where the Johainah tribe lived during the prophetic era, at the outskirts of Madeenah. People still live there as I saw houses and other buildings as we drove pass the village almost encompassed between the Radwah, Ajraad and Ash’ar mountains. Actually, Madeenah is surrounded by mountains, but on your way to Al-‘Ula through Mada’in Saleh and beyond, there are mountains everywhere you turn. Al Johani, my tour guide reminded me of some of the men around the Messenger, blessings and peace of Allah be upon him that were from Johainah. He mentioned the narrative of a handsome person amongst the companions of the Prophet called Dihyah Al Kalbi. Arch Angel Gabriel (Jibreel) was reported to have appeared several times to the Messenger of Allah (SAW) in the form of Dihyah Al Kalbi. Angel Gabriel would come to the chambers of the Messenger of Allah and start talking to him in the presence of Um Salamah. When she was asked who it was that came and spoke to the Messenger of Allah after he left, she said that it was Dihyah Al Kalbi because Gabriel came in his form. She realised the mix-up only when she heard the Messenger of Allah relating to his companions from the pulpit what transpired between him and Arch Angel Gabriel. (Sahih Al Bukhari. Book 6. Volume 61. Hadith 503). This same man of Johainah, Dihyah Al Kalbi was the emissary of the Messenger of Allah to Heraclius, Emperor of Byzantium. Heraclius: Is the family of the person claiming prophethood a noble one? Abu Sufyan: It is a noble family. Heraclius: Has anyone else in his family claimed prophethood? Heraclius: Has there been any king in this family? Heraclius: Are the people who have accepted this religion weak or influential? Abu Sufyan: They are weak people. Heraclius: Are his followers increasing or decreasing? Abu Sufyan: They are on the increase. Heraclius: Have you ever known him to tell lies? Heraclius: Does he ever commit a breach of any pact? Heraclius: Have you ever fought against him? Heraclius: What was the result? Abu Sufyan: Sometimes we won and sometimes he. Heraclius: What does he teach? Abu Sufyan: He bids people to worship one God and not to associate any partners with Him, to offer prayers, to be truthful and chaste, and to bestow alms. "You say that this man belongs to a noble family. Prophets always come from noble families. You say that no one else in the family ever before claimed prophethood. Had it been so, I would have thought that he was influenced by family traditions. You say that none of his predecessors was a king. Had it been so, I would have thought that he was aspiring to attain kingship. You admit that he never tells lies. A person who does not tell a lie to a man cannot tell a lie about God. You say that poor people are the adherents of his creed. The first followers of prophets always come from this class. You say that his religion is expanding. This is a characteristic of a true religion. You say that he does not deceive. Prophets do not deceive anyone. You say that he bids you to offer prayers and to observe purity and chastity. If all this is true, his realm will come right up to my domain. I had thought that a prophet might be coming, but I did not think that he would be born in Arabia. If I could go there, I would have paid homage to him." Another such companion as came from the Johainah tribe was Basbas bin Amr Al-Johni, the first spy of Islaam commissioned by the Messenger of Allah to gather intelligence for the Muslims against the Quraishi army in the build-up to the Great Battle of Badr. Others were Dhamrah bin Amr, the brother of Basbas, ‘Uqbah bin ‘Aamir, Tha’labah Al Johani, and many others. The journey from Madeenah to Al-‘Ula took three hours, but I felt as if we travelled for about 30 minutes. This was for a cocktail of reasons not least the du’aa’us safar, prayer for travel, where we asked Allah to let our journey be covered quickly and most easily, the breath-taking scenery as we cruise the Madeenah-Al-‘Ula road, and for the fact that my tour guide made the trip so educating and entertaining that hours passed like minutes. He had useful information to give on every settlement that we encountered, on every caravan route of old, and on battlefields, reciting copiously from verses composed by poets of the period of ignorance to the time of Islaam, and citing various historical events that occurred during that epoch. 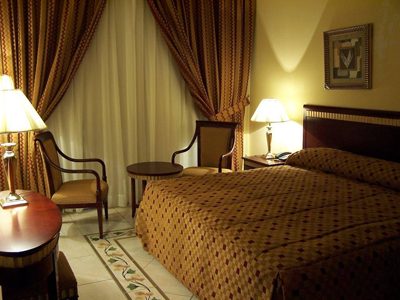 Al-‘Ula Arac Resort is a four-star tourism lodging equipped with necessary requirements and utilities; managed by competent, English-speaking personnel who provide excellent services to its guests and tourists at all times. Actually, when I spoke to the General Manager over the telephone I thought him to be an American. It was in the morning that I met Mr Rafat Farajat, and only then realised that he is an Arab with flawless American accent. Visits to tourist sites, in both Al-‘Ula and Mada’in Saleh, are not allowed after sunset, so, I took a shower and sat in the garden of the Resort, situated right in the middle of, and encompassed by the rooms, restaurant and reception area. The ambience of the place is serene, natural and the passages adorned with beautiful flowers. Al-‘Ula is also called Wadi al-Qura, (the valley of villages), and even Ad-Deera by the local inhabitants. I was expecting to see a village in every meaning of that word, but as Mr Abdul Kareem promised me the day before, I was utterly surprised with what I saw in the morning. Everything in Al-‘Ula is good – wide roads paved with asphalt like any other modern city stretching up to Madinah from one side and to the town of Tabuk on the other, beautiful structures sprouting all over the place, constant electricity, shopping malls, super markets, etc. No, this is not my definition of a village! Also, from ancient time all the way up to the sixth century, Al-‘Ula was subjugated and dominated by four different states: Didan, Lihyan, Mu’een, and the Nabateans – the Thamud. We moved northeast of Al-‘Ula to see Al-Khuraibah one of the most important archaeological sites in that area. Here you find many tombs carved into the mountains. The tombs are not alike. Some are simple chambers cut into the rock with rectangular burial places cut into the walls and floors. The interiors of some recalls the tombs of Mada’in Saleh (which I will revert to later) with the difference that the later are more accurately cut and better planned with ornamentation that is more sophisticated. Other tombs are small cubic chambers that held two graves at the most. Most of them are two metres long and sixty to eighty centimetres wide and seventy to one hundred centimetres high. Others look like simple rectangular cavities cut into the mountain and designed to hold a single grave. The best known tombs of this kind are the so called Maqaabirul Usuud, Lion Tombs, because of two pairs of lions carved on top of each side of the tomb. We then moved to the old town of Al-‘Ula which is a unique example of an Islamic city from the classical period. It consists of a walled village of about 800 dwellings around the perimeter of the more ancient castle with narrow winding alleys, many of which are covered to shield the people from the heat of the sun. Most of the foundations of the buildings are stone, but the upper floors are made from mud bricks, while palm leaves and wood are used for the ceilings. Although many of these houses were probably rebuilt over time, their foundation is likely to be from the original construction of the town in the 13th century AD. The houses had no openings on the ground floor other than a fortified entrance. This old town of Al-‘Ula was built around a high plateau adjacent to the mountain above which is Musa bin Nusair or Umm Nasser Castle. My guide and I climbed to the summit of this castle using the original stairway carved in the rock many centuries ago. From this height, one could see much of Al’Ula as well as watch closely the entire old city. The castle was used as a control point to safeguard the town against any attack, and to alert the population of the coming of any danger from outside, like enemy advance and so on. We afterwards travelled to Mada’in Saleh – the Capital of the Monuments - which lies about twenty-two kilometres to the north of Al’Ula. The locals also call it Al-Hijr, just as it is in the Glorious Qur’an, in reference to the Thamud people and Saleh, the prophet sent to them. In fact, a whole surah in the Qur’an is christened as Al-Hijr (Surah 15). The people of Saleh have been referred to in verse 80 of the same surah as as’haabul Hijr (The People of the Rocky Tract). For anyone who visits Al-‘Ula and Mada’in Saleh, the rocky country and the spacious fertile valley (wadi) and the plains of Qura are there for all to see. In spite of all these, some academics are searching for archaeological evidence to confirm the presence of Thamud at Mada’in Saleh. There is nothing wrong in looking for proof to substantiate any claim; it is part of knowledge. They can keep searching, but I do not need any archaeologist to confirm to me what I have read in the Qur’an concerning Thamud, more so that I have now visited Al-Hijr and seen for myself all the traits contained in the Book about the people. The Qur’an (7: 74) speaks about the ability of the Thamud to build for themselves ‘palaces and castles in open plains, and carve out homes in the mountains.’ I saw, in the tour of Mada’in Saleh, this mastery of the Thamud of carving dwellings as well as necropolises for the dead out of mountains. What people describe as ‘tombs’ in Mada’in Saleh cannot all be tombs due to the noticeable differences in their shapes and sizes. Some of them could better be designated as small chambers, living quarters, since no graves were cut into the rock inside them. These so-called tombs and chambers at Mada’in Saleh are the sites most impressive and most recognised monuments. The site holds ninety-four monumental tombs with decorated façades, thirty-five plain chambers, and more than one thousand non-monumental graves and other stone-lined tombs. We went to Qasr al-Fareed, which lies in the southeastern part of Al-Hijr. It was called “al-Fareed” (The Unique) because it was cut into a single huge rock; it also includes an architectural element not found in any of the other tombs. The façade of this tomb or chamber (palace) occupies most of the northern side of the rock. There is Qasr al-Bint on a mountain, which extends from north to south, and contains a group of twenty-nine tombs divided in three sides. There are nineteen tombs on the western side, one of which was left uncompleted, the mason having started with the upper part of the façade, where the verandas are located, without finishing the rest. Had the façade been completed, it would have been the largest tomb façade in Al-Hijr. Great post! Thanks for sharing. Really very informative and very useful post about AL-‘ULA AND MADA’IN SALEH. 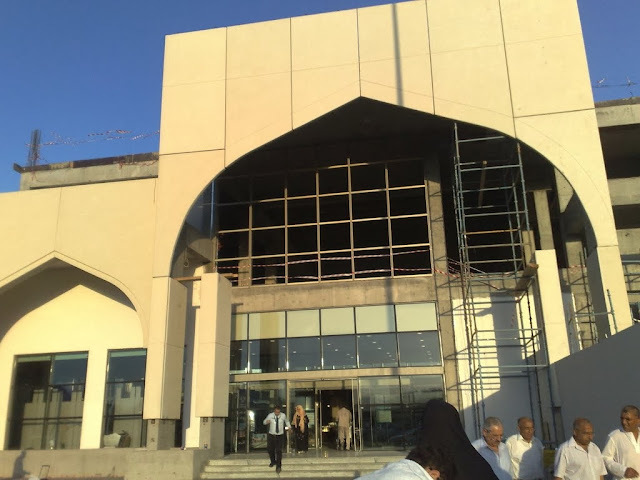 I was to catch a flight to Riyadh, the capital, and connect a twice-a-week Saudi Arabian flight to Al-‘Ula, but the schedule would disrupt my plans of signing final papers of exit for our pilgrims. Yes, Amir; there is a twice-a-week Saudi Airlines flight to Al-'Ula via Riyadh the connection of which I could not wait for due to the reasons I stated. I later learnt from the airline that the flight was suspended as works are doing on at the Al-'Ula airport. So, it was indeed a good idea that I went by road after all. I enjoyed reading you blog post above very much. I wonder if you would mind answering some questions for me about your visit - did you visit on a Friday? Are you aware of the opening hours on a Friday, and if they are restricted at all? What other places of interest are there in the area? I just saw your comment and questions. My visit was not on a Friday, but there are no restrictions at all. You can also consider Najran, Qasrul Imarah, etc for your visit. Al Okhdud is another place of interest. Try Ha'il if you can, and the Oasis City of Najd. Medina (/məˈdiːnə/; Arabic: المدينة المنورة‎, al-Madīnah al-Munawwarah, "the radiant city, also transliterated as Madīnah, is a city in the Hejaz, and the capital of the Al Madinah Region of Saudi Arabia. The city contains al-Masjid an-Nabawi , which is the burial place of the Islamic prophet Muhammad, and is the second-holiest city in Islam after Mecca.